"This page isn't really anything to do with our safaris but outlines a fly trap project we've started and are keen to develop." - Chris Morris, Director, IntoAfrica UK Ltd.
For over 30 years I have been travelling regularly to East Africa and my work has taken me to many Maasai villages. In the dry seasons, when most cows are away grazing, the villagers have no problem with flies (and this is when most of our visitors travel to Kenya). But in the rainy seasons, the cows return and the flies come with them, often plaguing the homesteads and contributing to the spread of diarrhoea, eye infections and other diseases. I often mused (as flies copulated on the edge of my tea-cup), on how to get rid of them. So, on my last trip I tried out some variations on a fly-trap design which I first saw described by Prof. David Morely on the TALC website. I've returned to UK now, excited by the initial results and hopeful that a simple, costless, practical solution to provide some relief from the fly problem might be possible. These notes are the result of my first experiments. These fly traps exploit a feature of fly* behaviour that seems universal i.e. when the flies take-off, and they have a choice between heading towards a dark place or a light place, they always head for the light. They will also stay in a light area and not walk, crawl or fly towards a darkened area. So the traps work by attracting flies, through small entry slits, into a dark baited area at the bottom of the trap (a large plastic water bottle covered by black plastic bags with a smelly bait inside). There they feed, defecate, regurgitate or whatever else they do on the bait. When taking off they rarely go back out through the entry slits, but head upwards towards the funnelling top of the bottle, which is not covered by black plastic and appears light to the flies. They then crawl or fly through the top of the funnel into the large bright upper section of the trap (a second water bottle) - where they buzz around until they dehydrate and die. After an hour or so observing hundreds of flies caught in the top section, I never saw a fly go back down the inverted funnel to the bottom section and freedom. Several traps were made, each from similar, empty, clear plastic, drinking water bottles (5 & 10 litre capacity). The bottles, once cut and trimmed to purpose, were pinned together using acacia thorns. Black polythene bags were used to cover and darken the bottom section, double thickness to keep out all light. Sisal string or strips of cloth used to hold the black polythene bags tight to the bottom section. All of these materials are widely available and usually just thrown away. The traps can be made in about 30 minutes and cost absolutely nothing. See illustrated photo/diagrams for construction method details. I then tried them out in several locations during my visit. 5 litre bottle trap in chicken run in a Nairobi back-yard. 5 litre bottle trap, by a small window near the cooking area of a mud-walled hut in a mainly agricultural area but with cows, dogs, cats and chickens around. 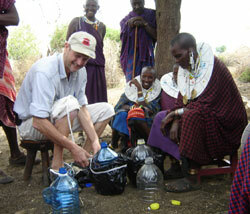 5 & 10 litre bottle traps, outside location, within typical fly infested Maasai bomas. Whole ground area covered in animal droppings, with livestock present each night, and small goats, lambs and chickens present all day. Immediately it was clear that they worked, and worked very well. On one occasion flies literally followed the milk-bait as I poured it into the trap, which delighted the bemused and possibly sceptical Maasai women watching me, as two flies were caught within seconds. 5 litre traps worked well, but 10 litre traps were better. 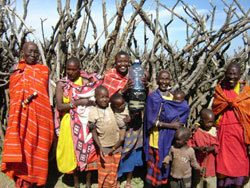 Caught approx 750 flies a day in a Maasai boma in a 10 litre trap. About 300 a day in the 5 litre trap in the same location. All other variables, which might account for a difference, as far as I could tell, were about the same. Fresh milk, long-life milk, sugared water and meat (which starts to stink after a day or two) all mixed together, seemed to be a very effective bait. Although no other baits were tried it seemed superfluous as this worked so well and all ingredients were readily available in the trap locations. Fresh milk from cows in the village was so effective that the flies were following it into the trap as it was being poured into the entry ports. As two or three days passed, and the concoction started to "brew" it became even more potent at attracting flies. Important to keep the bait moist, by adding water occasionally when needed. If the bait dries, it reduces the smell. Important to keep trap somewhere with light falling on the upper section, so flies move up through the trap towards the brightness. After several days, the floor of the upper trapping area becomes messy with fly debris, excreta and dead flies. This darkens the area that needs to be clear and allow light to pass through, attracting the flies upwards. Therefore essential to remove the dead flies and wipe clean every few days. 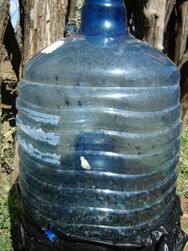 flies in a 10 litre trap Using acacia thorns to pin the top and bottom parts of the trap together is very effective. This method makes separating the top part of the trap, to allow removal of dead flies and cleaning very easy .. Simply remove the thorns and the two parts can be separated. If live flies are still in the trap when separating (which they most likely will be), quickly removing the top in bright sunlight, keeping it vertical, and placing it on the ground will contain them until removal of dead flies and cleaning is completed. Then it can be put back swiftly with most live flies still inside. Even if flies escape they will almost certainly get caught again. Bottle-neck length from the bottom section into the top section didn't seem crucial. In fact cutting off the neck to leave a simple gap in the dome of the bottom section was the method used in the 10 litre trap which caught about 1,500 flies in 2 days. Probably do need a few small vent holes in top section to let some "attracting" odour escape, prevent condensation, and to stop air becoming stale and hot which may deter flies from moving up into top section. Condensation may be a problem as dead flies may start rotting with water present, and trapped flies would not dehydrate and die as quickly if there was water they could drink. Better to hang traps slightly off ground to prevent ants and small animals eating the bait, or children, animals or the wind knocking the traps over. Flies in the trap seemed to be >99% the same species - Musca sorbens. Occasional blue-bottle type. Occasional fruit fly type. No other insects. A 2 week placement of a 5 litre trap in a chicken run in a Nairobi back yard, with two "emptyings" dramatically reduced the local population of flies. Flies, which were previously all over the chicken's food (scraps from the kitchen) and around the pen, were present but sparse after this time. Dead flies, (approx 2,000 - I didn't count them precisely) which were removed from the trap, were all immediately eaten by the chickens. As the most effective bait seems to be basically a concoction of milk, sugar, rotting meat, food scraps etc. it is possible that there is an unintentional health hazard by having such fly-bait present in the traps. But rotting food on its own doesn't cause disease; the disease organisms need to be introduced to a dirty or rotting food preparation environment where they can thrive and spread and cause problems when eaten or contacted and this is an unlikely scenario. Also the baits are small amounts in enclosed "hard to get at" locations. Even if there were a potential health hazard here, the health advantages of the traps would probably far outweigh the disadvantages. I guess the traps will not have much impact on overall fly populations because the environment suitable for fly breeding is not changed in any way, so they will continue to breed where conditions are favourable, and they will only reduce fly populations around the trap locations. It will probably even attract flies from elsewhere into the now fly-depleted environment, so in that sense it's basically "fly harvesting". These fly traps can be made from simple materials that are universal and readily available at absolutely no cost whatsoever - "bila pesa" in Kiswahili. They are extremely easy to construct, work very effectively, and would seem to require little maintenance. I would think these are key factors for effective fly control in poor rural locations. If the dead flies are fed to chickens, they might make a significant contribution to egg & meat production - tasty. It could be a win/win solution. I did not stay long enough in any one of the trial sites to give responsibility for maintaining the traps to anyone, and see how that worked. I sense there may be a problem with up-keep. Probably needs to be a key person charged with responsibility to empty, clean and check bait stays moist. This might be where most research input is needed to find a way of ensuring the traps are maintained. Effective delivery to rural village communities, where the fly problem is greatest, would probably need involvement of NGOs with experience in organising community development initiatives - I guess. If it could get off the ground in a few areas then maybe possible to involve a mineral water company, and get them to put fly-trap instructions on the back of their bottle labels. They would then be promoting recycling and reusing of the bottles. Maybe then, they notice an increase in demand for a particular type of bottled water, which is best suited for later use as a fly-trap. May even then get the manufactures of the bottles to alter the shape of their bottles to make them better traps or traps easier to construct during their second life. Now all that is needed is some decent funding to get the idea properly tested and up and running. Anyone reading this with ideas for potential funding, or who to approach, or experience of writing successful grant proposals - please get in touch.